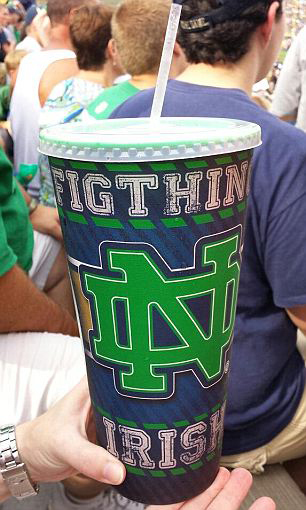 The football team of the Catholic Notre Dame University in Indiana has a nickname: the Fighting Irish. Unfortunately, last week's game was partially overshadowed by the fact that the 50oz cups of soda, priced at $8, looked like this. Notre Dame spokesman Dennis Brown declined to say how the typo occurred or whose fault it was. Hmm. I wonder if that's what the person responsible was told while he or she was being rollocked to high heaven. Unless, of course, it was a gaffe by Dennis himself. Anyway, you may well ask whether it's typical Irish stupidity. Yet they're the ones selling a drink of pop for $8.